Senior guard Yuta Watanabe looks down his shot during a men's basketball game at Richmond Saturday. Men’s basketball had its best shooting night since Atlantic 10 play began, but still allowed all five Richmond starters to score in double-digits. The Spiders finished shooting 58.0 percent from the field – 13.7 percent higher than GW’s clip. No team has shot a higher percentage against the Colonials since last January. Richmond (4-13, 2-3 A-10) trailed for nearly a quarter of the contest, but defeated GW (8-10, 1-4 A-10) 78–68 Saturday to pick up its fourth win over the Colonials in two years. With four minutes to play, the Colonials trailed by six points and had possession of the ball. But on both of the next two possessions, they turned the ball over, allowing the Spiders to spark a 13-2 run. Richmond led by eight or more points for the rest of the night. GW totaled two fewer turnovers than the Spiders, but Joseph said his squad made too many mental errors to stay in the contest. The Colonials are now on a four-game skid, going back to a Jan. 3 loss to Duquesne. They are still yet to win a game on the road – holding a 0-7 record in games outside of the District. Defensively, GW had the most challenge with redshirt freshman forward Grant Golden. He scored 24 points on 10-of-14 shooting and helped Richmond garner a 16-point advantage in the paint. Along with Golden, freshman guard Jacob Gilyard scored 19 points, sophomore guard De’Monte Buckingham scored 14 points and redshirt junior guard Khwan Fore and sophomore guard Nick Sherod added 11 and 10 points, respectively. No bench players on the Spiders found the scoreboard. Steeves led GW with 23 points on 9-for-13 shooting followed by graduate student forward Bo Zeigler who tallied 16 points and a game-high nine rebounds. As a team, the Colonials shot 44.3 percent – their best mark since a Dec. 20 win over New Hampshire. 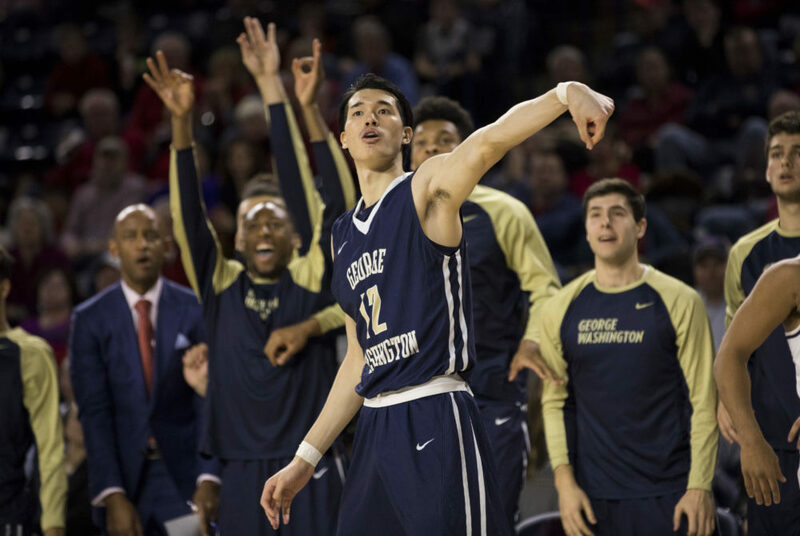 The Colonials took their first lead of the game in the fourth minute of play when senior guard Yuta Watanabe hit a running jumper off the backboard, giving GW a 4–2 advantage. Following a jumper from freshman guard Terry Nolan Jr., Richmond went on an 11-2 run by pushing the pace and following the offensive aggressiveness of Golden and Buckingham. The Spiders’ five-point lead at the time was their largest of the first half. Richmond finished with 14 transition points to GW’s zero. Around the 10-minute mark, Buckingham was wide open for a dunk and on the following possession Golden went to the line for two free throws. But when neither opportunity resulted in points, GW took advantage. The Colonials quickly built up an 11-0 run that gave them a seven-point lead. Golden took over offensively in the final four minutes. Despite makes from Watanabe and Steeves, he led the Spiders back within one by controlling the inside offensively. Richmond took advantage of a GW turnover and a dunk from Buckingham gave the home team a one-point lead. The Colonials allowed another easy inside hoop, but Watanabe tied the game up 51 seconds before the half. Richmond went into the break with a 34–32 lead after Golden found the bottom of the net with a second chance effort. Zeigler was the first to score in the second half, tying the game up at 34. But GW’s momentum didn’t last long, as layups from Fore gave the Spiders a four-point cushion less than four minutes later. After another two minutes of action, Nolan hit a three-pointer and sophomore guard Jair Bolden was on the line for three shots – with a chance to take a lead. He missed twice and Richmond responded with an 8-2 run. The Spiders lost their lead by turning the ball over on three consecutive trips down the court and inside baskets from Steeves and Zeigler cut the deficit to one. GW never recaptured the lead or a tie as Richmond slowly build its advantage to double-digits in the final minutes. The Colonials return home Wednesday for a 7 p.m. game against George Mason (9-9, 2-3 A-10).